Oh Baker’s, Where art Thou? Put out an A.P.B. We have a missing label alert! While researching the Jim Beam Small Batch Collection, I noticed that a certain member of that lineup no longer appears to have much of a dedicated web presence. 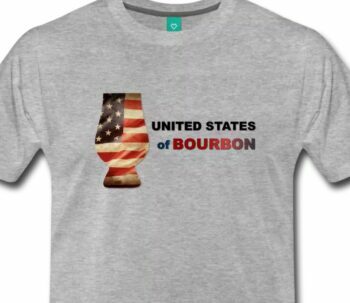 Where is Baker’s bourbon? The only online listing I can see is on the Beam Suntory website, and the link there takes readers to…Booker’s Bourbon website. Is this a bad sign for the label, or am I just reading too much into it? After all, I still see plenty of Baker’s on store shelves. It could just be a lack of marketing focus. Perhaps there is a new promotions campaign in the works, and we’re catching it between pushes. Either way, it’s not a great sign. With the general shortage of aged bourbons and the removal of the age statement from Basil Hayden’s, it makes one question whether the folks at Jim Beam looked at their lineup of bourbons and thought Baker’s to be redundant. After all, the stat sheet on Baker’s makes it seem a little bit of an afterthought. 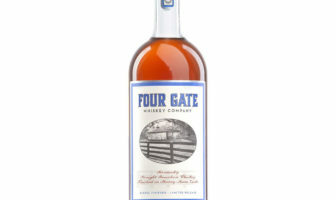 It is a small batch bourbon aged 7 years, and bottled at 107 proof. It’s the standard Jim Beam recipe. So in the grand scheme of the small batch collection in that same mash bill, there’s Bookers, a 7ish year uncut and unfiltered small batch bourbon. Past that, there’s Knob Creek, a small batch bourbon which checks in at 100 Proof, and the Knob Creek Single Barrel at 120 proof, both at 9 years. So it’s either a younger, stronger Knob Creek or a weaker Booker’s. Thinking about it in context of the labels in competition for that same mash, it looks a little bleak for Baker’s. The somewhat recent additions of the Single Barrel expression of Knob Creek and the 12 year version of standard Jim Beam have to be putting a strain on the inventory of aged bourbon available to the folks in Clermont. They may be best served de-emphasizing one label to allocate those barrels to other, more “in demand” bottles. Perhaps it’s getting harder to find enough 9 year old barrels to fulfill demand for the Knob Creek Single Barrel picks. Or perhaps it’s Booker’s that needs more 7 year old barrels. Or maybe demand for Baker’s, the oft-forgotten member of the lineup anyway, is simply not strong enough to warrant a dedicated website. If the people at Beam-Suntory are indeed moving Baker’s to the back burner, it’s a sad effect of the Bourbon Boom, though understandable from a business perspective. Contacts at Beam-Suntory have not yet responded to email messages, but I hope to have some information straight from the source. 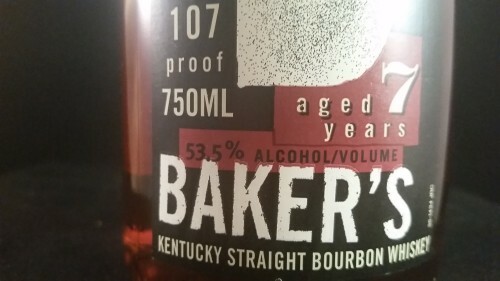 I find Baker’s to have a significantly sweeter profile than Knob Creek and less complexity than Booker’s (not to mention lower proof–which may contribute to that.) So, I think I understand how it fits in the Beam catalogue even if it is just the standard mashbill. Consider how it relates to Kirkland: Both on the sweet side, both 100+ proof, both 7 years old. “Objective” difference? (By which I mean what you can measure or quantify.) The first thing that jumps out is price. 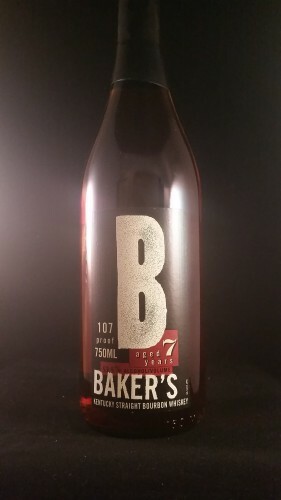 With that said, I find Baker’s is still a couple rungs up the ladder in terms of taste. But de gustibus non disputatum est. Or, your mileage may vary. I’ve noticed that the major retailers in my area have dropped the price to below $30.00 a bottle. Last time that happened, Knob Creek went NAS.